The LC-4 compact, negative-stiffness vibration isolator supports weight loads from 1 to 130 lb. 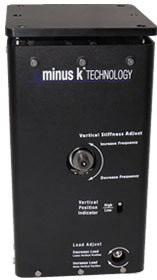 A low-frequency version has a 1.5 Hz natural frequency, while an ultra-low-frequency version achieves 0.5 Hz. Completely passive—using no air or electricity—the isolators can be combined into multi-isolator systems for heavier loads.